Yesterday was International Women's Day, so what better way to celebrate than painting our nails?! There were tons of events going on to recognise the day across the UK, you can read more about it and learn how to get involved here. I chose to create a mani based on a fictional woman who stands her ground in a heavily male dominated world, Wonder Woman! I had a particularly fetching Wonder Woman costume as a child and recently the boyf bought me a framed comic, so it seemed quite fitting. I've seen a lot of comic/superhero inspired nails around which helped me put together this ensemble. I chose a relatively simple design as I find when I attempt more complicated ones they can turn out a bit of a mess. 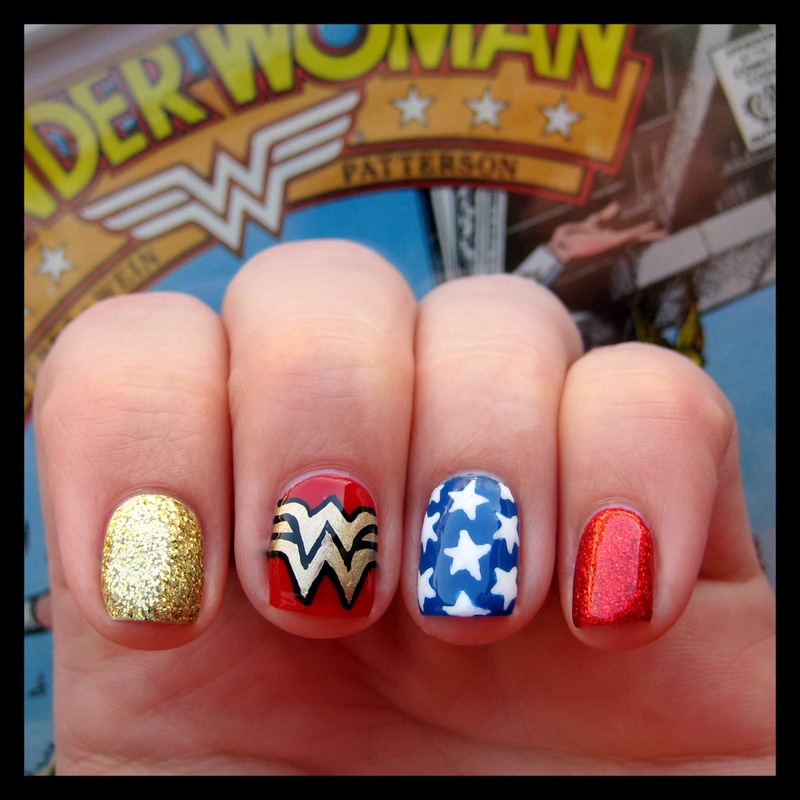 I wanted to include Wonder Woman's three main colours - gold, blue and red, her logo, stars and glitter (obvs!). The colours I used here are Models Own - True Blue & Gold Finger, Barry M - Blood Orange & Red Glitter, and Primark black and white nail pens. I'm really pleased with how this design came out. The glitter bookends are super sparkly and frame the Wonder Woman designs perfectly. Mani's inspired by great women, real and fictional, could be a new theme! Did you create any nail art to celebrate International Women's Day? Also, we'd love to know which women inspire you and why? This looks great! I am totally in love with the polish on your pinky!